QUEZON CITY -- The Ateneo Blue Eagles successfully defended their UAAP men's basketball title after defeating the UP Fighting Maroons, 99-81, on Wednesday night in front of 23,471 people at the Smart Araneta Coliseum. 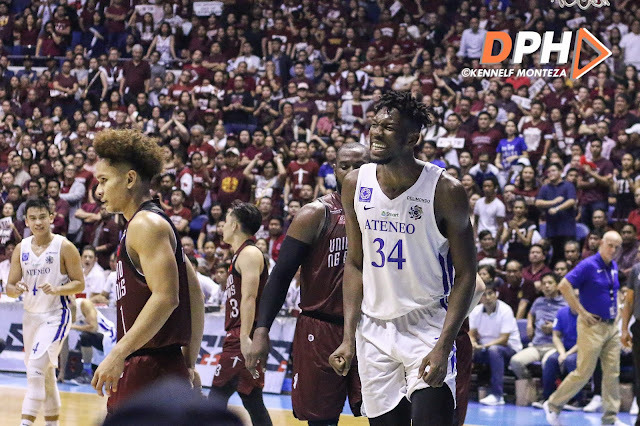 The Thirdy Ravena-Ange Kouame tandem proved to be impenetrable as they helped secure a championship for Ateneo, finishing off the battle for the crown in just the second game of the best-of-three series against UP. 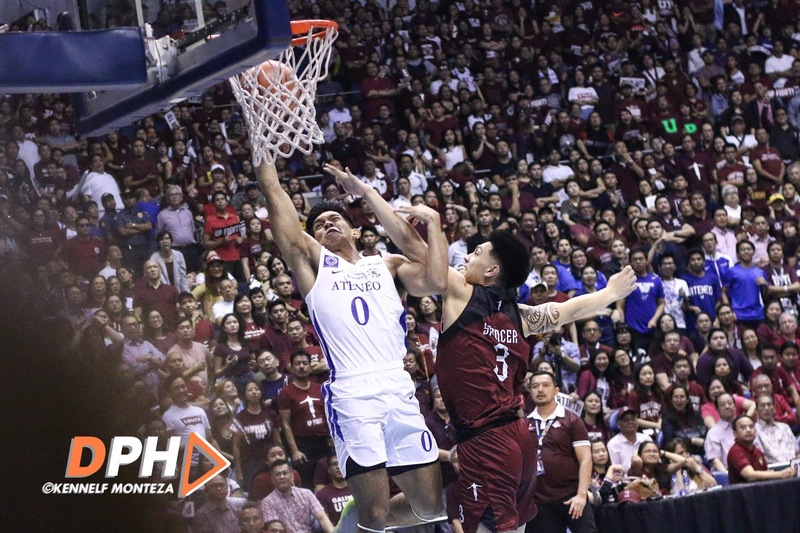 Ravena, who earned the title of Finals MVP at the end of the game, produced a monstrous stat line of 38 points, 6 rebounds, 6 assists, and 3 steals and was able to make 72 percent of his field goals. Meanwhile, Rookie of the Year Kouame, who walked home with his first championship win in the UAAP, made 22 points and 21 rebounds while delivering 2 solid blocks for the team. The Fighting Maroons, though outrebounded by the Blue Eagles, 51-33, put up a good fight behind 24 points, 7 rebounds, and 3 assists from Mythical Five member Juan Gomez de Liano. 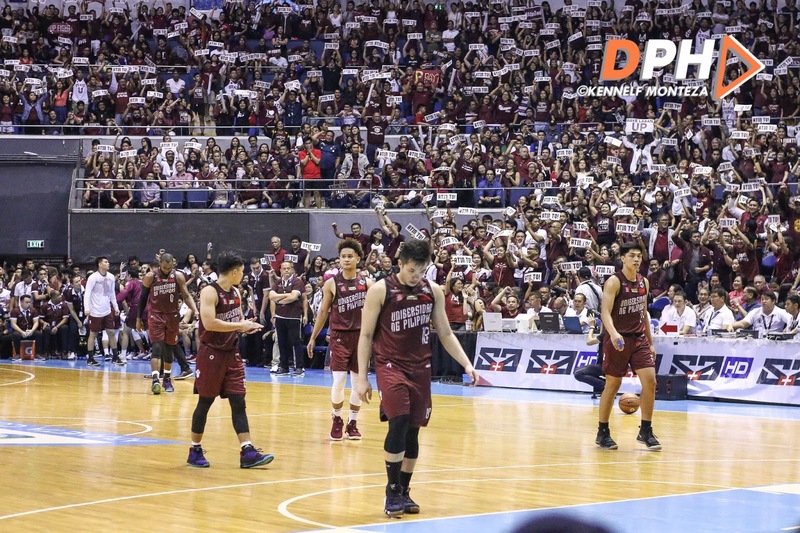 The season MVP Bright Akhuetie chipped in 19 points, 8 rebounds, and 2 steals, while graduating team captain Paul Desiderio exited the league with 15 points, 7 rebounds, and 3 assists. Ateneo (99) - Ravena 38, Kouame 22, Verano 11, Tio 7, Nieto Ma. 6, Asistio 6, Belangel 6, Go 3, Nieto Mi. 0, Mamuyac 0, Mendoza 0, Andrade 0, Black 0, Wong 0, Daves 0, Navarro 0. UP (81) - Gomez de Liaño Ju. 24, Akhuetie 19, Desiderio 15, Gomez de Liaño Ja. 11, Dario 8, Lim 2, Vito 2, Manzo 0, Jaboneta 0, Murrell 0, Spencer 0, Prado 0, Española 0, Longa 0.